The traumatizing prospect of a Loopy De Loop cartoon being shown theatrically would seem a near-impossibility today, yet such a thing did happen when Columbia announced its glittering roster of short subjects for the 1967-68 season. I hesitate to dwell upon the horrific bill of fare on studio schedules during that benighted year, a truly frightful period for theatre-goers. 1967-68 heard the dying gasp of old-time exhibition --- showmen and distributors still clinging to antiquated notions that short subjects could bring customers back to theatres. Newsreels had finally disappeared with the closure of Universal and Metro’s units, and cartoons were being farmed out to independent producers or temporary hirelings whose sole concern was to make them cheap and quick. I can still recall the feeling of dread evoked by opening fanfares for sixties cartoons. 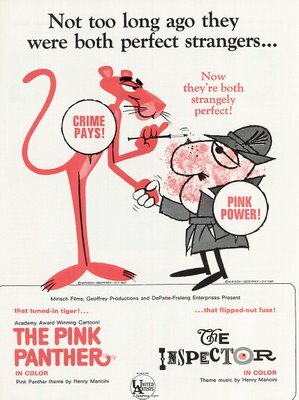 Knowing the vintage ones on TV were infinitely better, we’d have better been spared Pink Panther or Woody Woodpecker intrusions into otherwise desirable programs. 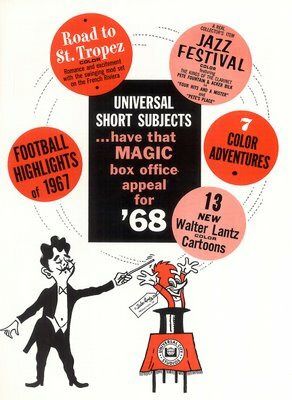 I was shocked to learn that there were over 300 short subjects released in 1967-68. This sounds very much like the motion picture equivalent of as many shots in the belly they give when you're bitten by a rabid dog (okay, maybe 300's a bit of an exxageration, but it was at least 20). I can’t imagine their being shown to any audience today other than recalcitrant prisoners of war from whom one is trying to extract classified information. 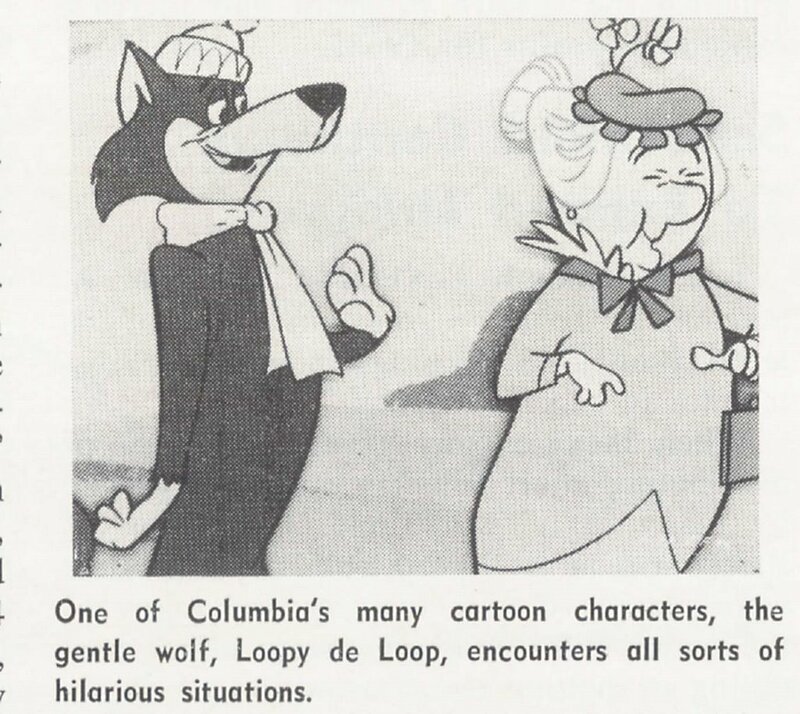 As you’ll note in the captioned still, "the gentle wolf" Loopy De Loop was Columbia’s star attraction for the season. Hanna-Barbera had been commissioned by the studio to produce these cartoons for theatres. An act of colossal effrontery, you might say, considering the fact we’d been getting all of H&B’s output for free on the home screen since, what, 1959? Was that the year Huck Hound first appeared? Anyway, things had deteriorated far enough by the mid-sixties that I for one could no longer tell these Photostatic characters apart. There was a Hokey Wolf, as I recall. How did he differ from Loopy? No doubt they were both gentle, befitting pabulum diets we were getting from TV cartoons by way of vigilant cereal and toy sponsors determined not to frighten children or offend their parents. Other than minor species differentials, what indeed was the distinction between Wally Gator, Lippy Lion, Magilla Gorilla, and The Hillbilly Bears? These were dark days for animation. It’s a wonder our generation survived it. Never mind the damage sustained by Viet Nam and the drug culture. It was these cartoons that consigned many of us to a lifetime of sloth and indirection. Hanna and Barbera, you were great with Tom and Jerry, but you still have much to answer for! One can overlook Universal. Those Woodpeckers were never much good to begin with, let alone Chilly Willy and the rest of the Lantz menagerie, but Warners! How could they? By this time, they’d even junked the tunnel opening for their cartoons. Sacrilege! 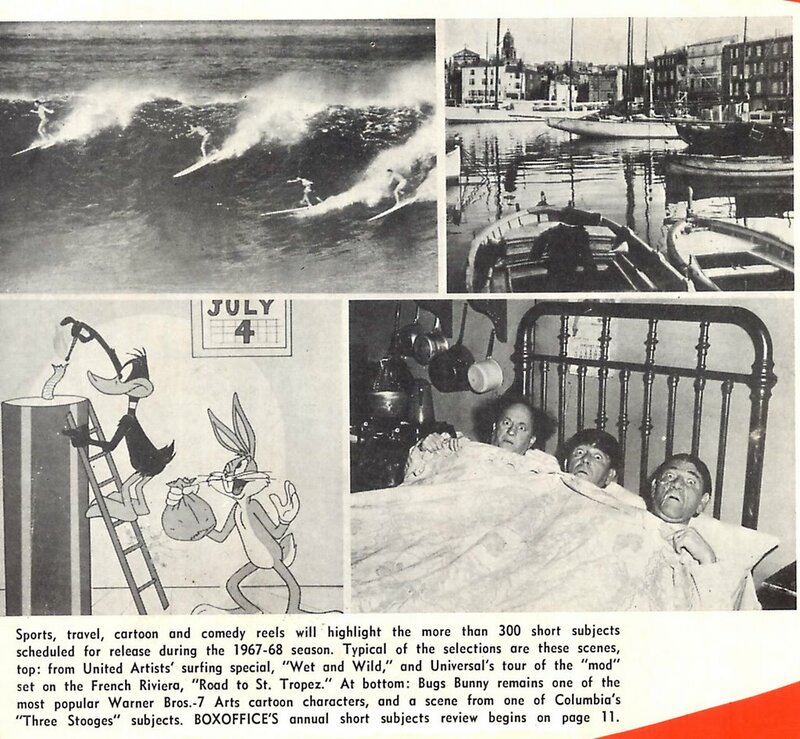 Note Bugs Bunny and his welcome banner for the two arriving nondescripts. Was there ever an uglier logo than that of Warner Bros./Seven Arts? The idea that it would now open a WB cartoon is a stench in the nostrils of Heaven. I’ll not speculate as to who Cool Cat and Merlin The Magic Mouse are. I’ve not seen any of their adventures, hope never to, have no idea how many cartoons they appeared in, and refuse to look it up. Am I too harsh? Are they undiscovered classics? 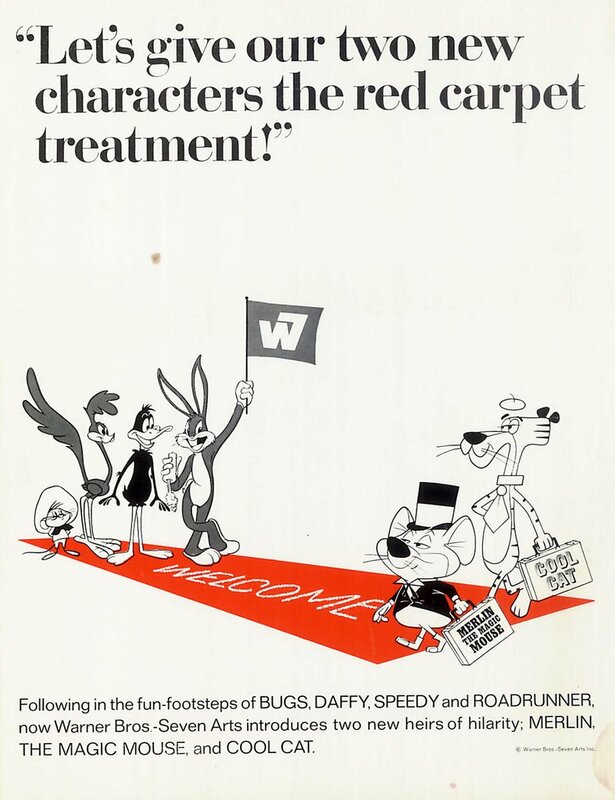 Merlin looks sorta like a Chuck Jones creation in this trade ad, while Cool looks like a H&B clone --- but wait, Top Cat was cool too, and he came first (and for free), so why pay to see this guy? 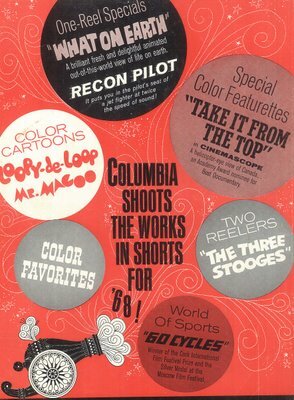 I wonder if any of the Cartoon Network offshoots run these late Warner shorts. I do know what some of them cost to make. On the high end, there was Bunny and Claude, a "special", which had a negative cost of $35,360. Chimp and Z was $35,065. Average cost for the 1967-68 group was a lean $26,704. This was only a couple thousand more than they were spending in the early fifties, but in those days, of course, you got a lot more for the money (Duck Dodgers was made for $24,022 in 1953). MGM promised eight new Tom and Jerry cartoons for 1967-68, along with twelve "Gold Medal" subjects (re-issues). Average cost for a T&J that year was $32,603. The total cost for the season was $260,826, but rentals only added up to $199,386. The Tom and Jerry series was now a losing proposition theatrically, but television revenues from the cartoons would make up the loss. The twelve re-issues were more lucrative. Total rentals for these were $179,833, and this was clear profit, beyond prints and distribution cost. Car Of Tomorrow was making its third go-round for rentals of $15,657 --- it had gotten over $135,000 total since initial release in 1951. Bad as these new Tom and Jerrys were, Metro at least knew how to market them. While other cartoon libraries were being ground up in syndication, the T&J series enjoyed network play throughout the sixties and much of the seventies. These sales helped MGM get back that money they’d lost in the theatres. 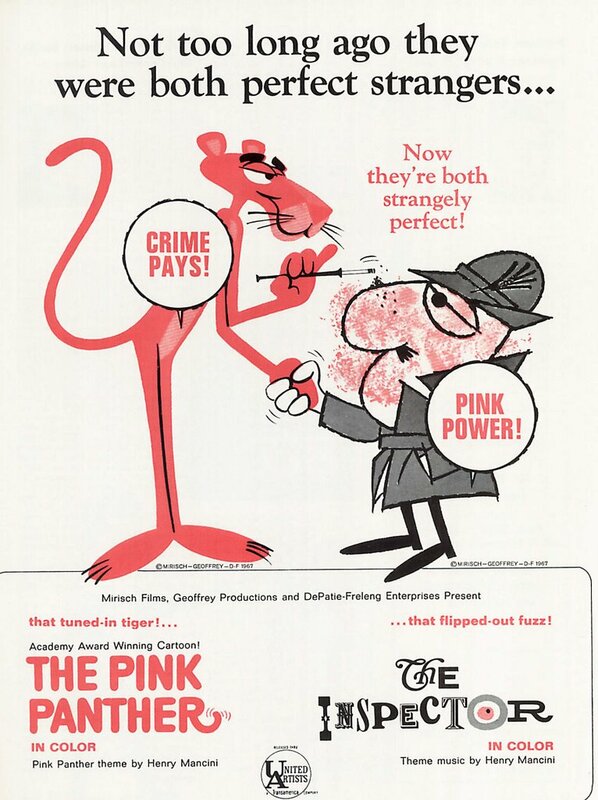 United Artists, meanwhile, had over a dozen Pink Panther cartoons in the pipeline, along with the Inspector series. The formulaic structure of these was rigid, if not calcified. I used to take seven minutes to linger around the snack bar and check out posters in the lobby whenever one would start. The live action shorts mentioned in these ads were about as stimulating as filmstrips at school, notwithstanding the fact that we were watching them on our own time, and paying an admission for the dubious privilege of doing so. Our suffering wouldn’t last much longer, as short subjects disappeared altogether within a few years. No frills exhibition would soon become the norm. If there is a modern equivalent of shorts, it may well be the endless commercials that delay the start of contemporary movies by as much as twenty minutes. As amazing as some of today's animation is, I'm astounded at how much stiff, messy, unappealing stuff is also out there. No one has ever surpassed 1937-55 Warner Brothers--not even Disney, imho. Cool Cat debuted in 1967, appeared in six cartoons and was voiced by Larry Storch. Basically he was a "hip cat" with lingo that has dated as badly as any 1960's "Dragnet" drug episode. He does hold the distinction of appearing in the final Warner Bros. cartoon release, "Injun Trouble" from 1969. Merlin the Magic Mouse also debuted in 1967. The character was patterened after W.C. Fields, and in the true Hanna-Barbera mold, he had a pint-sized sidekick. Daws Butler did the voice for the debut cartoon; after that, Storch took over for the remaining four. Both characters died when the theatrical animation unit finally, definitively, closed its doors... for thirty years, anyway. It's interesting to see Bugs Bunny in that trade ad. By then, Bugs - like Disney's Mickey - was more of a figurehead. If he was on theatre screens at all in 1968, it was in reissues; his last original title appeared in '64. The difference between Hokey Wolf and Loopy DeLoop: Loopy was supposed to be French, and Hokey was supposed to be Phil Silvers. What a surprise to see the Stooges still being offered to theatres... I would have thought that the entire catalogue had reached the tube by then... even those horrible Joe Besser things that just die once you get past the singing opening title. Still, a Stooges short - even a Shemp - might've gotten me in a theatre playing "Don't Raise the Bridge, Lower the River." "If there is a modern equivalent of shorts, it may well be the endless commercials that delay the start of contemporary movies by as much as twenty minutes." Hie ye down to a theater and catch any Pixar animated movie, such as the just-opened "Cars." Not only do you get a well-written and well-animated feature presentation, you also (always!) get an original Pixar-animated short to go with it. I dunno. "Cool Cat" was okay in some shorts, especially the last two, which was directed by Robert McKimson (I personally like the very last LT, "Injun Trouble", which is hard to find due to censorship). Cool Cat made a handful of subversive cameos during the 1995-2000 run of "The Sylvester and Tweety Mysteries" cartoon series and turned up as a very minor character but a major plot point in the "Tweety's High-Flying Adventure" DVD, released in 2000. Joe Alaskey voiced the cat's sole line in that feature. The crew knew full well how bloody awful the character was; the posthip beatnik feline appeared only for the sake of ridicule, precisely because he was long forgotten. On the subject of hellish theatrical shorts, I once sat through a 1968 Paramount Famous Studios Bill Dana cartoon (in a movie theater during the year it came out) that was so crappy it induced dry heaves. By the end, Famous Studios deserved to die. I've seen Cool Cat and Merlin; the only thing worse than these cartoons are the soundtracks. Robert McKimson proved why he was second-tier at best. My only memory of Cool Cat is the way he'd announce himself as "Coooool Cat", and the only image in my mind is from an old grape jelly jar glass I had as a boy. Even at that early age, kids new crap when it was served to them. Nowadays kids are born victims, and they'll accept anything. You're right, John, Hanna and Barbera do indeed have much to answer for. You're a year off on Huckleberry Hound's debut; it was 1958. But even Huck was not the beginning of H-B's depredations -- that dates back to December 14, 1957 (a date which will live in infamy), when The Ruff and Reddy Show first appeared on NBC. Hanna and Barbera did more than anyone to destroy the art of animation, and I have often toyed with the idea of going back in time to, say, 1938 and persuading them to go into some other line of work -- dentistry, perhaps, or typewriter repair. I think I would be willing to give up all the Tom and Jerrys of the 1940s if it meant escape from what Bill and Joe wrought once they moved into TV. 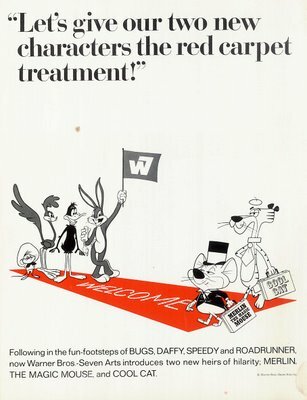 Unlike Jay Ward with Crusader Rabbit and Rocky and Bullwinkle, they couldn't even be original or clever. Everything was a pale imitation of something else -- Flintstones/Honeymooners, Jetsons/Blondie, Top Cat/Sgt. Bilko -- with no understanding of what made the original good in the first place. Let's not even talk about Scooby Doo, Where Are You?, so execrable it makes Clutch Cargo look like Fantasia. 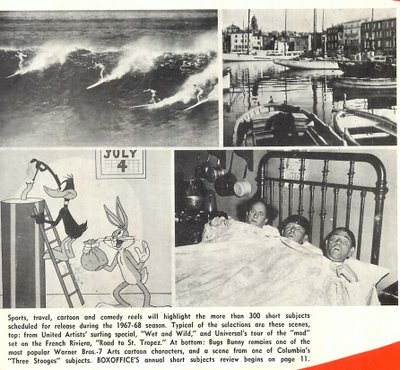 The poetic irony is that television, which enabled Hanna and Barbera to grow rich betraying their heritage, also kept that heritage alive for generations of kids who watched Bugs, Daffy, Popeye, and Betty Boop thinking, "Gee, I'd like to do something like that," then grew up to do it and rescued animation from the sinkhole of the Saturday morning ghetto. The sick thing is, lately I've actually seen MORE of those mid-to-late sixites shorts being played on television than the classic WB stuff. I'm not sure why, but the last two or three times I managed to catch a Looney Tunes showing on the Cartoon Network they were trying to shovel late-era Road Runner/Speedy Gonzoles crap down my throat instead of the genuine article. The hell? (And yes, several times they have played the Merlin/Cool Cat crap, as well as ... Bunny and Clyde. The latter seems to be especially popular on UK airwaves. No, I do not know why. I wish I had been spared from seeing any of them at all). Even now the name 'Bill Lava' strikes terror and revulsion in my heart. The blaring, brassy strains of his scores evoke nightmare images in my head of green shag carpeting, bright orange drapes, and big glases of generic RC Cola. I'm not sure why, but yeah, immediate nausea. Following Carl Stalling up with that guy is insulting to music listeners and members of the human race in general. I was wondering how those Three Stooges shorts wound up being shown at the Coolidge Corner theatre in Brookline back around '70 and '71.I'd thought they'd just been lying around and somebody decided to show them-I didn't know that there was an official reissue program.How anachronistic for '68. Man, I'm amazed anyone admits to knowledge of 'Bunny and Claude' ("a rabbit and his broad", to quote the theme song).